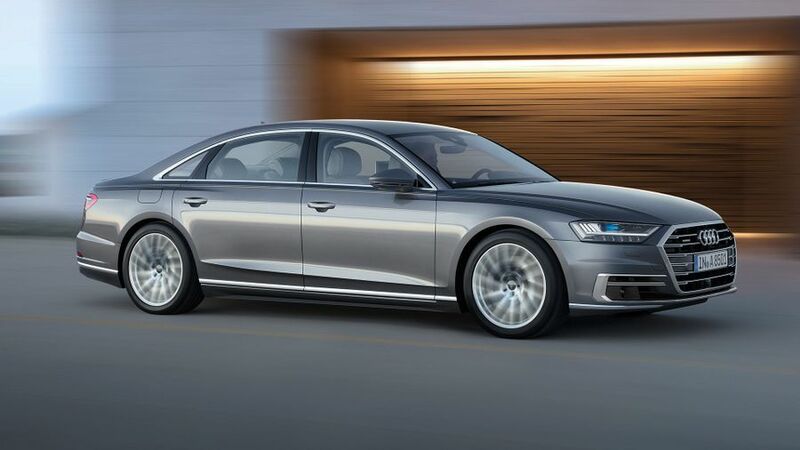 A rival for the likes of the Mercedes S-Class and BMW 7 Series, the new A8 is more spacious than its predecessor, and comes packed with some impressive new technology. 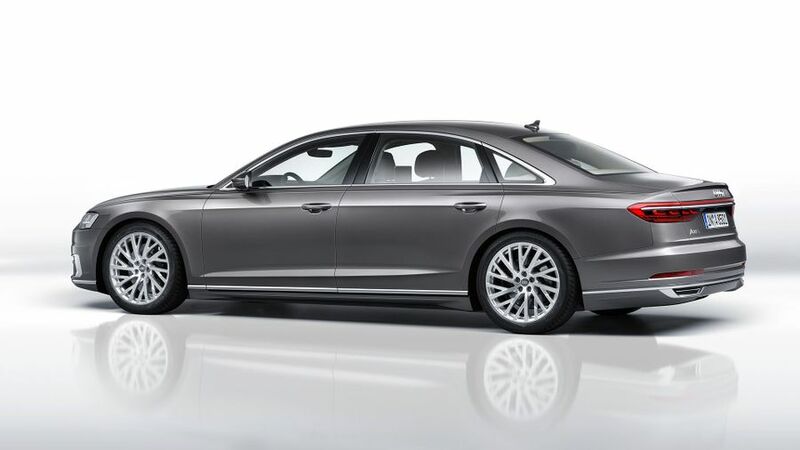 These are the first pictures of the all-new Audi A8. The company’s largest saloon will go on sale later this year, bringing more space, luxury and technology than its predecessor. At 5.17 metres long, the new A8 is almost exactly the same length as its major rivals, the Mercedes S-Class, BMW 7 Series and Jaguar XJ. Like them, it will be available in both standard and long-wheelbase forms, the latter increasing the distance between the front and rear wheels by 13cm to give even more space in the rear seats. The front end of the new car is dominated by its large grille and the company’s LED headlights with laser lighting, while the rear has an LED light strip running across the full width of the car. Inside, the new A8 will provide even more space than its predecessor, and the long-wheelbase version has the option of a ‘relaxation seat’ in the rear. Not only does it incorporate a footrest, there is also a unit built into the back of the front seats that can massage or warm the soles of the rear seat passenger’s feet. In addition, passengers in the back can control the ambient lighting, the reading lights and seat massage, as well as making private phone calls through a separate unit. The remote control, with its smartphone-sized display, is a removable unit housed in the centre armrest. In the front, the A8’s infotainment system is operated by a new system based around a 10.1-inch touch-screen. When it’s turned off, its screen fades to black, meaning it blends almost invisibly with the black material that houses it in the dashboard. It works in conjunction with not only a second touch-screen display on the transmission tunnel that controls the air-conditioning system, but also a voice control. Technology is a major feature of the new A8, and Audi says this is the company’s first car to have been developed for highly automated driving. So, among the features available is Traffic Jam Pilot, which can take charge of driving in traffic at speeds up to 37mph, controlling the accelerator, brakes and steering. Beyond that, the car can also park itself through the remote parking pilot and remote garage pilot systems. The manoeuvre can be started by the driver – who doesn’t need to be sitting in the car – via an app, and they can watch a live stream from the car’s 360-degree cameras of the car doing its thing on their smartphone. Every model comes with Audi’s quattro four-wheel drive system, but four-wheel steering and a fully active suspension are also available. So, depending on the speed the car is travelling at, the rear wheels are turned either in the same or the opposite direction as the front wheels. That means the car combines easy low-speed manoeuvrability with more dynamic handling and great stability at higher speeds. Beyond that, the height of each wheel can be controlled electronically, allowing the car to deliver smooth ride comfort or sharp handling, depending on what the driver wants. Eventually, A8 buyers will have a choice of five engines, but the first cars to arrive will be powered by a pair of turbocharged 3.0-litre engines, one petrol, the other diesel. They will be followed in due course by a 4.0-litre V8 diesel and a 6.0-litre W12 petrol engine in the most expensive model, as well as an e-tron hybrid model that combines a 3.0-litre petrol engine with an electric motor, which gives up to 31 miles of driving on electric power alone. As yet, there’s no word on how much the new A8 will cost, but we would expect the range to start from somewhere around £70,000. All Audi has confirmed so far is that order books will open in September, with first deliveries expected late this year.